Please make sure that BesCarol is the sole authorized seller of the latest version VER 009S-X of the graphics card. -Equiped with 8 high quality solid capacitors. -Supports 1x,4x,8x,16x PCI-E slot of the motherboard. -The slot equipped with a metal shielding net to shield external interference and make the mining more stable and efficient. -A 12V and a 3.3V voltage LED indicator real-time monitor whether the card power supply is normal. 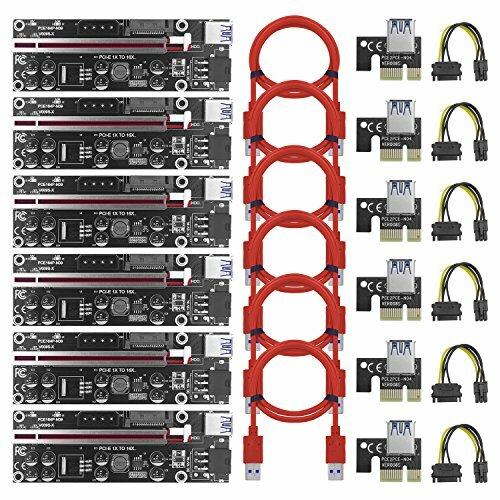 -Integrated 4PIN, 6PIN, SATA 15PIN, three different power supply port to reduce the burden on the motherboard when connected to multiple graphics cards. -PCI-E connector uses multi-layer shielded wire, up to 3M without signal attenuation. -60cm USB 3.0 riser cable enabling flexibility in the placement of your PCI-E devices. -The power cable adopts pure copper wire, which avoids burning the wire during mining. -Plug and work, no driver required, easy to install and use. 1.Make sure the computer is out of power when you plug in or out the PCI-E extension cable. 3. To prevent ruining your computers and other equipment, please find the right end to plug in the cable. VER 009S-X: Version 009S-X riser kits are the LATEST and top of the line solution for setting up GPU mining rigs.Working great for Bitcoin , Litecoin , Dogecoin, and other crypto currency mining. MAKE SURE THE SELLER IS BESCAROL. ANY OTHER OFFERS ON THIS LISTING ARE UNAUTHORIZED SELLERS. Only BesCarol provide quality products ,free replacement and money back guarantee. ENHANCED STABILITY & SECURITY:Equipped with 8 high quality solid capacitors ,which make the card power supply more stable and safe, prolonging the service life.Dual voltage LED indicator real-time monitor whether the card power supply is normal. EASY INSTALLATION & WIDELY APPLICABLE:PCI-E card can be inserted in any PCI-E slot: 1x, 4x, 8x, or 16x.Slots are equipped with a metal shielding net to shield external interference and make the mining more stable.Suitable for all Window systems, LINUX and MAC. MULTI-INTERFACE OPTION: The upgraded usb riser with large 4 PIN + SATA + 6 PIN Graphics interface,which provides Graphic card independent power and reduces motherboard burden when using more Graphic cards. If you have any questions about this product by BesCarol, contact us by completing and submitting the form below. If you are looking for a specif part number, please include it with your message.